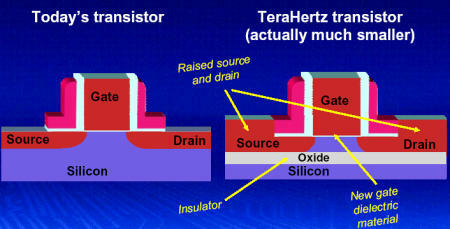 Terahertz transistors are the new generation semiconductor transistors developed by Intel Corporation. The researchers in Intel had developed a new transistor structure that maintains Mooreâ€™s law and would lead them into the discovery of these high speed new generation transistors. The terahertz transistor basically has higher speed (in GHz), High power efficiency, and high heat reduction capacity. These transistors have a fast switching rate of more than trillion times per sec. They also have the capability to perform 50 to 100 times faster than normal traditional transistors. The first terahertz transistor was only capable for handling 3GHz. But the latest terahertz transistors is capable of handling more than 800 GHz (scientists at the University of Illinois at Urbana-Campaign have discovered a transistor with a frequency of 845GHz and 300GHz faster than previous discovery).By using this technology, we can create lot of real time functioning and powerful computing techniques such as grid computing, nano-computing and other researches. 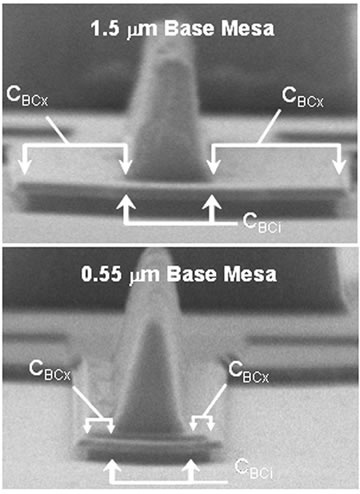 ï»¿Terahertz transistors basically contain three major changes than other conventional transistors. They have thicker source and drain regions and a special ultra thin insulating silicon layer too. These silicon layers integrate below the source drain region. The comparison between terahertz transistor and normal transistor is given below. ï»¿Terahertz transistors are from made from indium phosphide and indium gallium arsenide that helps to increase its speed and thermal handling efficiency. The grading is an important factor that affects the transistor performance. The compositional grading of these components enhances the electron velocity and also improves its efficiency too. The construction of these transistors is very complex and researchers also refine their fabrication process to produce tinier transistor components as compared to normal transistor. Â They are designed to be very thin in shape and size (12.5nM approx). Vertical fabrication scaling process is usually used so as to reduce the distance of electron travel and produce a higher speed with better efficiency than before. All the terahertz transistors are low power high temperature handling components than existing transistors. By the proper design techniques, these transistors are produce very less amount of heat and very low leakage currents. Due to these reasons, these types of transistors provide greater efficiency (80-95%). These devices are normally very small in size (very tiny junction making process). Due to the smaller size, we can implement these chips inside micro components such as ICâ€™s,MPU,MCU,etc. Is this the same terahertz transistors announced in 2001, or is this new stuff?